On a first date, a single rose symbolises love at first sight. it can also be given in years to come to say, "I still love you." Give someone two roses to represent your mutual love and affection. traditional one month anniversary gift. To send the message “We’ll be together forever,” send a bouquet of nine roses. A perfect dozen shouts "Be mine!" Tell someone that they'll be your friend forever with a bouquet of thirteen roses. Need to let someone know that you're sorry? Send them fifteen roses. Twenty-one roses say, "I'm dedicated to you/"
Two dozen roses shouts "I'm yours!" Send a message of congratulations with twenty-five roses. Three dozen says "I'm head over heels in love!" To express a love that knows no bounds, send a bouquet that's equally as limitless - filled with fifty (or more) beautiful luxurious roses. 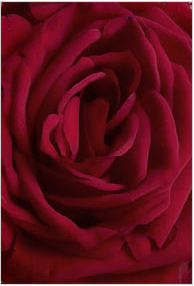 Did you know that roses are not only native to the United States, but they are also our national floral emblem? Or that June is National Rose Month? Or that the rose is the state flower selected by Georgia, Iowa, New York, North Dakota and the District of Columbia? The beauty of this extraordinary bloom is matched only by its seemingly boundless history and legend. For example, it’s said that Cleopatra once received her beloved Marc Antony in a room knee-deep in rose petals, and that the rose was sacred in ancient times as it represented Aphrodite to the Greeks (and Venus to the Romans), symbolizing beauty and love. An old legend has it that originally all roses were white. One night, a nightingale saw a rose and fell deeply in love, inspiring him to sing a song. (Before this, nightingales only chirped and croaked.) When his passion overtook him, he pressed himself against the flower, and when the thorns pierced his heart. Ever after, the rose was forever colored red.